Processing facilities consist of a copper concentrator, hydrometallurgical plant, copper smelter, sulphuric acid plant, copper and gold/silver refineries. Recent expansions included a Svedala autogenous mill, additions to the flotation sections, two counter-current decantation thickeners, a new anode furnace gas-cleaning plant with additional electro-refining cells and an electric slag-cleaning furnace which has been scheduled to be rebuild in August 2017 during the Major Smelter Shutdown. 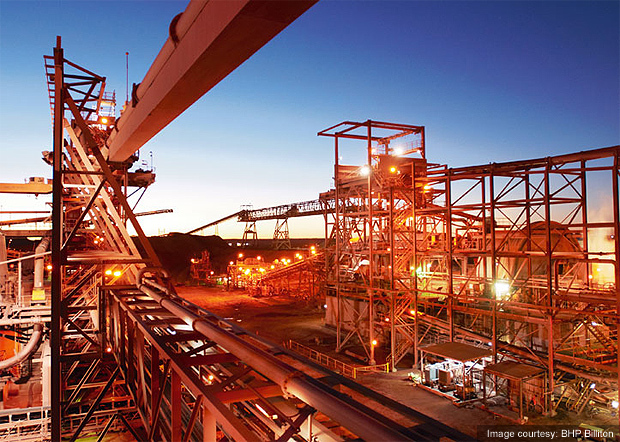 When client BHP Billiton wanted to utilise temporary special construction cranes for their Electric Slag Furnace Rebuild (ESFR) at Olympic Dam Mine Site (SA), they turned to Eilbeck Cranes and both worked closely together to bring to light a bespoke engineered solution for this special application. Lifting hoists travel synchronously while maintaining 5 + 5T (2 off 5T) MRC and independently maintaining 5t MRC each. The temporary construction cranes were planned to be used for the ESFR Major Shutdown (MSD) at the Olympic Dam facility. The requirement was for the temporary construction cranes to be specifically designed ‘fit-for-purpose’, fabricated, tested and commissioned to meet the construction requirements of the ESFR strict standards whilst complying with Australian and key BHP Billiton Standards. The ESFR-01 (Transfer Crane) primary operation is the removal of slag launders (and associated spill trays) to create a lift corridor (‘lift well’), support furnace demolition and new shell installation. 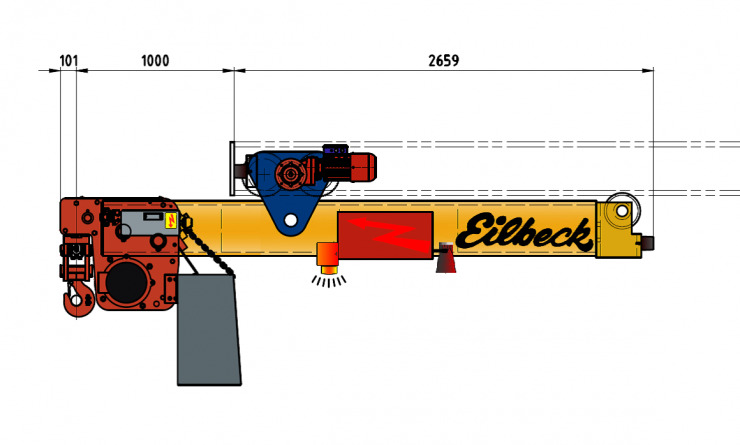 The requirement was for the hook to extend 1m beyond the Transfer Crane monorail beam end stop, to enable ‘place and pick’ transfers with ESFR-02. The hoist needed to be fixed in position to the trolley with the hook located at a maximum of 150 from the end of the trolley. As a result, the design of the Transfer Crane was a Cathead Hoist design. (Below Picture). The ESFR-02 (Circular Crane) primary operation is to be used for shell demolition shell construction and Composite Furnace Module (CFM) installation. This special crane consisted of a circular (closed) monorail system, where the crane end carriages travel on the circumferential direction for infinite rotations. The crane has two radial girders, where two cathead hoists (5t each) run. The cathead hoist has the ability to be extended (cantilevered) beyond the circumference of the circular monorail, in the same manner of ESFR-01. Cathead hoists can be operated independently or synchronised. 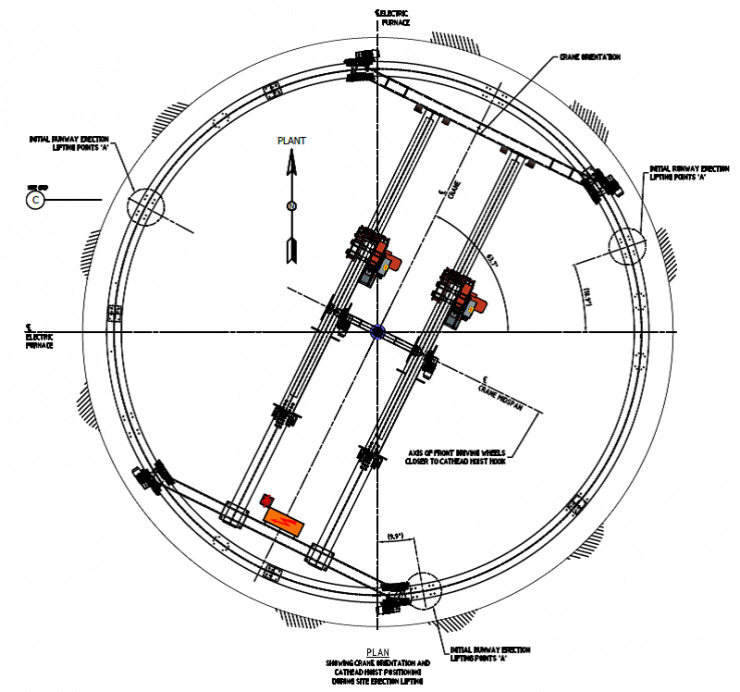 The centre line diameter of circular monorail is 11.08m, and it had to be divided into sections for ease of handling and installation on site. The assembly and erection plan of the circular monorail had to be engineered in a very specific way in order to be executed safely and efficiently on site. Many geometrical and positional constraints had to be dealt with in order for the complete system to fit in the very tight available space, and function properly. The cathead hoists are to travel together circumferentially (long travel of the crane) and travel both independently and synchronised in the radial direction (cross travel). The hoists needed be able to lift independently and synchronised. The hoists travel together circumferentially (long travel of the crane) and travel both independently and synchronised in the radial direction in full 360° (cross travel). The hoists are able to lift independently and synchronised.